CONCORD — “Power of the Flower,” at Concord Center for the Visual Arts, distills the sensuous delirium of summer. Curator Monika Andersson calls on accomplished artists in many mediums who push their content formally, technically, and thematically. It’s never just about being pretty. Darker notions balance the bright. To make “Poppy Garden,” Robert Creamer suspended dying poppies above and upon the surface of a flatbed scanner. Their peachy reds are still lush, but most petals fold down like skirts in crinkling decay, exposing waning pistil and stamen. Powdery yellow pollen sprinkles across the black ground. The piece is at once at a height — in color, in crispness — and tumbling down the far side of mortality’s hill. There’s a similar contradiction in Madeleine Lord’s welded steel irises, which blend the eternal sturdiness of her material with her subject’s inevitably fragile wilt and curl. For “Black Echinacea,” Andrew Millner digitally traced over photos of a coneflower field shot from many perspectives. Just under eight feet long, the piece jitters and bursts like a fireworks finale, but it’s all white on black — bounteous, yet skeletal. Color, then, is a caffeinated tonic. In Ilana Manolson’s “Red,” a woozy jolt of a painting, pink billows from spindles of ocher and red that define the contours of a blossom. She paints on Yupo, a waterproof, super-smooth synthetic paper: The paint slides, and Manolson slides with it. The vaporous pigment depicts the heady glory of a flower’s aroma as effectively as it does its form. 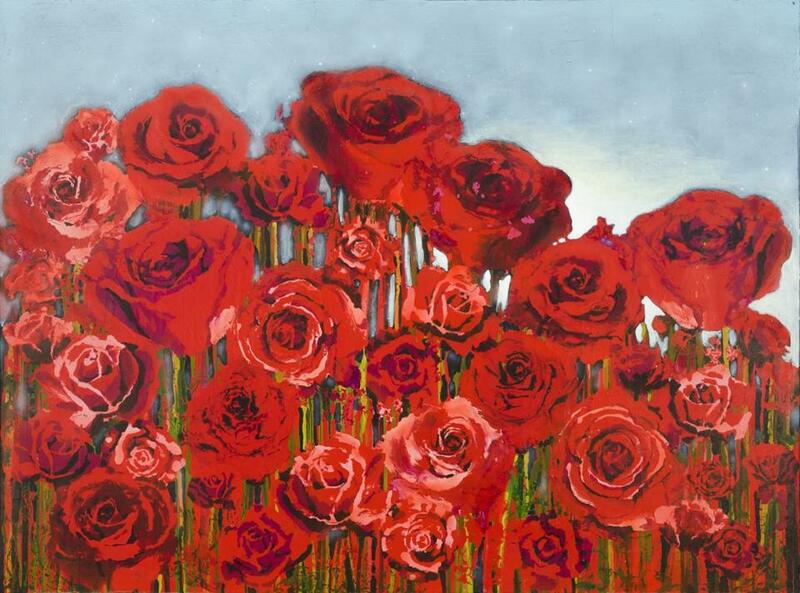 Amy Goodwin, likewise keen on paint’s yummy materiality, captures a rose garden in “Twilight Ruby.” Her spiraling, pillowy petals bob on soldier-straight stems. But there’s something ominous here, in those impossibly perfect stems and in the weight of the dusky, gray-blue sky. The metaphorical threat of night — more concretely, winter or loss — makes the abundance of a summer day precious. All the more reason to spend a splendid afternoon in the garden — or at an exhibit that gins up the season’s bittersweet pleasures.